In an unfortunate turn for humanity, our President-elect only listens to people who are talking to him through a TV screen, which means that we have to watch his hangers-on bicker and jostle for attention in public like a mass of elephant seals flopping around on the beach during breeding season. The latest: Trump advisor Kellyanne Conway has been loudly campaigning against the appointment of Mitt Romney as Secretary of State, calling herself a “concerned citizen”; MSNBC’s Mika Brzezinski and Joe Scarborough—the latter who reportedly advises Trump on the side despite that comprising a, uh, massive ethical breach—reported that “sources at the top” of the Trump transition team claim Donald Trump was “furious” about Conway’s comments on Sunday, when she suggested that Trump’s supporters would feel “betrayed” by a Romney pick. 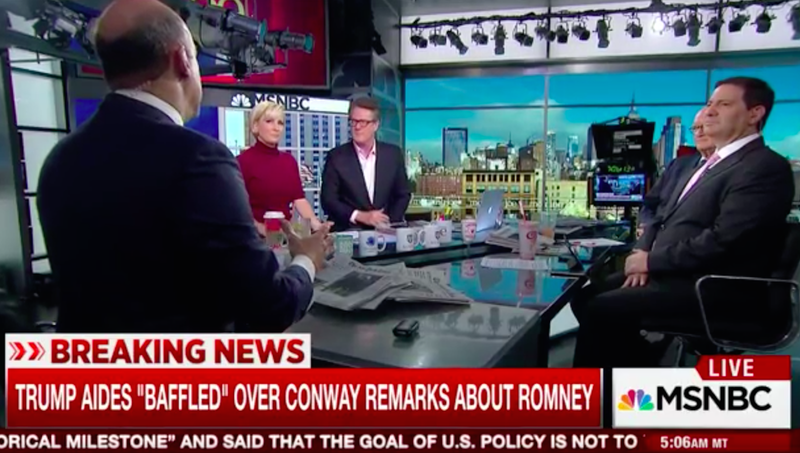 Conway reportedly texted Scarborough as Morning Joe aired to deny the report, claiming it was “sexist” and that she can have any job she wants. “What’s sexist? Why are they sexist for saying this?” Scarborough repeated. “What’s news?” would have perhaps been the better question for Joe to ask here. What’s worth writing about when something insane happens every three seconds and cable news hosts are semi-openly using their platforms to curry favor with a rising autocracy? If a panel of men wouldn’t mind weighing in on this for me, that would be great.